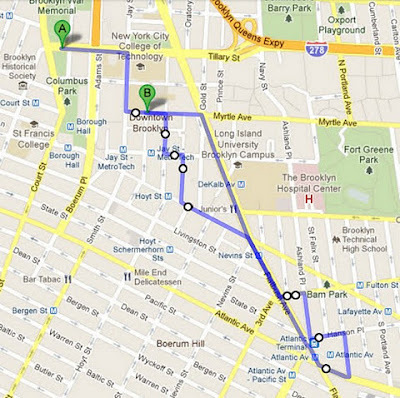 Maybe you already know about Occupy Brooklyn’s planned march tomorrow at 2:30 to “evict corporate greed.” If you do, then the map of the proposed march tomorrow should serve as a reminder for that event and also for the teach-ins that begin at 10:00 AM at the Korean War Veterans Plaza at Cadman Plaza which is near Brooklyn Borough Hall, at Cadman Plaza West/East between Tillary and Johnson. If you didn’t know about it before, this is your opportunity to put it in your calendar. 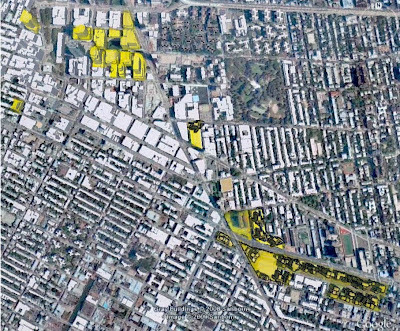 The map of the proposed march should be a reminder of something else: The vastness of Forest City Ratner’s government-assisted mega-monopoly on some of the most valuable and densely zoned real estate in Brooklyn. It is interesting to note how much of the march, which will be 2.5 miles of walking in all, will involve going either over the property of Forest City Ratner or will be tightly flanked by Forest City Ratner’s property. 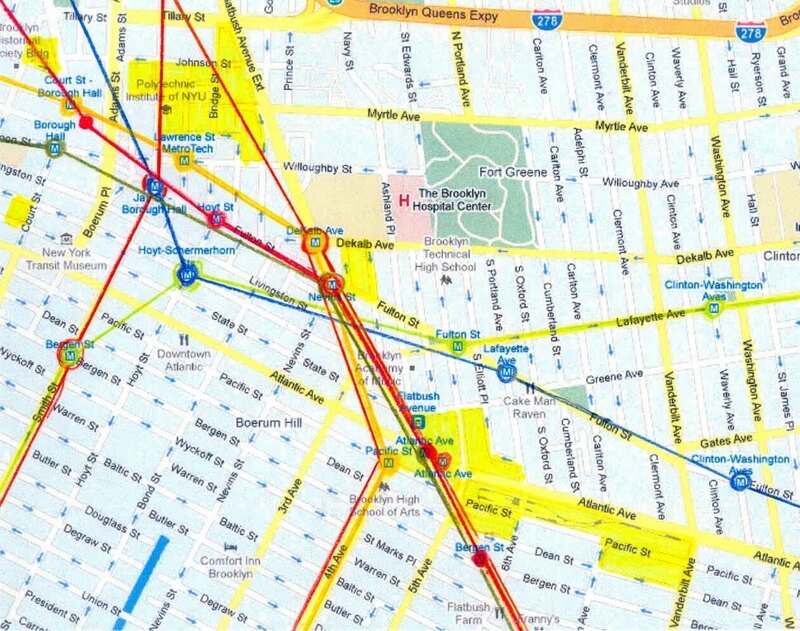 The marchers would have to walk even longer distances if they were going to travel along all of the property over which government is in the process of giving Forest City Ratner mega-monopoly control. In all it's 50+ acres. See the map below of the mega-monopoly to evaluate the close overlap. 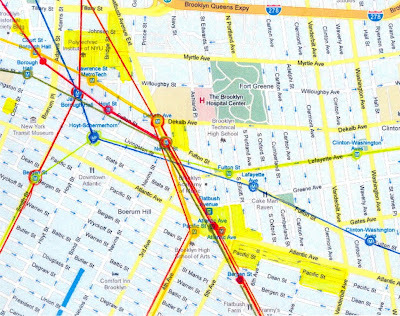 See also the second map that follows below to see how the mega-monopoly sits astride a confluence of Brooklyn’s key subway lines and most important subway stations. Presumably, the route was set in large part because this this is all real estate that is considered central, conspicuously visible and important to the populace of Brooklyn. While the theme of this march may be to “evict corporate greed” and while there are those marching who will likely have major gripes with capitalism itself, this astounding Forest City Ratner mega-monopoly (which absolutely should be “evicted”) is not the inevitable result of “corporate greed” nor the result of what should be considered normal healthy capitalism. The Forest City Ratner mega-monopoly could only have come about with the complicity of government. It is the result of what is referred to as crony capitalism, something that, in principle, the Wall Street Journal editorially rails against which in this respect aligns the Wall Street Journal (but perhaps not the Atlantic Yards-supporting New York Times) with the Occupy movements. Crony capitalism is draining to the economy in general and subtracts from the economic well-being of the 99%. I’ve been making the point, with articles under both the Noticing new York and National Notice banners, that opposition to crony capitalism, the teaming up of big corporations with big government, is something that should be a shared cause of both the right and left, both the Tea Party and the Occupy movement, including uniting them in opposition to the government assisted Ratner Atlantic Yards mega-monopoly. (See: Monday, October 24, 2011, On NPR, Echo of Coinciding Principles Noticed: What the Tea Party and Occupy Wall Street Ought To Agree On and Tuesday, October 25, 2011, Opposition To Crony Capitalism As Uniting Cause: Resource-Grabbing Mega-Monopolies (Like Atlantic Yards) As Catalyst For Great Recessions/Depressions. Yep, there’s no question about that, per Noticing New York articles on the subject: Saturday, March 26, 2011, The American Jobs Creation Act, Job Creation That Wasn’t: What Happens When Government Doesn’t Manage Its Programs. The march through Brooklyn is an important form of free speech, one that is likely all the more important where other forms of participatory democracy to influence politicians seem increasing futile. You may want to exercise this right before it vanishes or is circumscribed entirely beyond recognition. For an extended discourse on how this right of free speech and public assembly is put into jeopardy by privatization of traditional public space, including for instance, the Ratner absorption of streets, avenues, sidewalks, parks and plazas that were previously publicly owned space, see: Saturday, October 22, 2011, Occupy Wall Street and the Banks- Messages From Bonnie & Clyde, “They’ve Got Too Much Money”: Ownership of the Public Forum by the Wealthy? 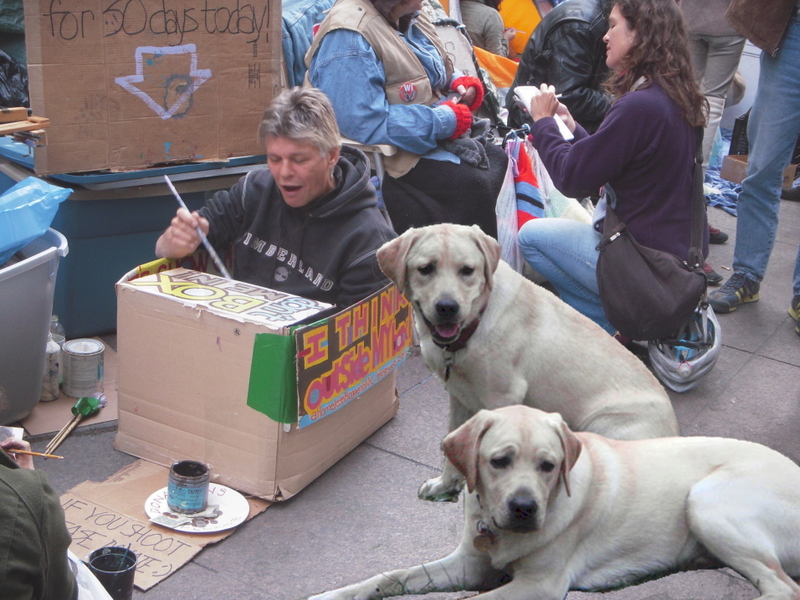 I hope that same article will also give amusing insight into why I created images, like the one below, of Bonnie and Clyde, Mayor Bloomberg’s dogs, hanging out with the Occupy Wall Street protesters. For links to more Noticing New York and National Notice articles about themes related to Occupy Wall Street and the Occupy Movement and to view some marvelous photographic portraits of Occupy Wall Street protesters, see: Tuesday, November 8, 2011, Faces of Occupy Wall Street: A Wonderful Site For Wonderful Sights. So there is the march, which is surely worth showing up for and then the teach-ins. Will those teach-ins also be worth showing up for? Probably. Again, they begin at 10:00 AM. I understand that Common Cause New York will be teaming up with Occupy Brooklyn to lead a teach-in “concerning some of our core issues like money in politics and corporate personhood” that will begin at 1:30pm at Brooklyn Borough Hall at Korean War Veterans Plaza, Cadman Plaza W. between Tillary St. & Johnson St. (Nearby trains: 2,3,4,5,R to Borough Hall, A,F to Jay Street). There is also a Facebook event page on this.